Please click on the thumbnails to download your preferred Operating Manual. 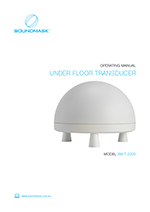 Soundmask’s transducers are purpose designed and manufactured for continuous sound masking service. The SM-T-1200 comes complete with a 500mm connecting lead with inlet and outlet connections. A variable slide fitting for attachment to the ceiling is fixed to the lead which is normally set at 300mm. Cable connectors are pre-cut for easy installation. All Soundmask transducers are manufactured with halogen-free wiring. 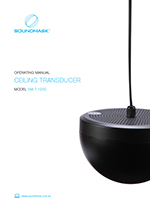 Soundmask’s transducers are purpose designed and manufactured for continuous sound masking service. The SM-T-2200 comes complete with a 500mm connecting lead with inlet and outlet connections. A variable slide fitting for attachment to the ceiling is fixed to the lead which is normally set at 300mm. Cable connectors are pre-cut for easy installation. All Soundmask transducers are manufactured with halogen-free wiring. Soundmask’s SM-EQ-2000 is used to shape the output of the SM-GR-3100. Specifically, the SM-EQ-2000 is a third Octave Digital Equaliser which connects to the generator via two XLR connectors. The random sound is then amplified through a 50W full bridge digital amplifier capable of driving 100 Soundmask transducers. The generator’s output can be adjusted to ramp up when the device is switched on for a more acoustically comfortable start up. 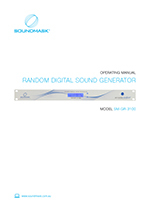 Soundmask’s SM-GR-3100 is the backbone of Soundmask’s systems and features a microcontroller controlled digital random noise generator with an effective frequency range of 20Hz to 20kHz. The digitally generated Gaussian noise is passed through a spectrum shaper to flatten its response through the midrange, corresponding to human speech frequencies. 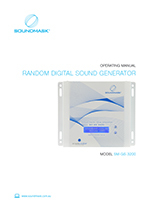 Soundmask’s SM-GS-3200 is a microcontroller controlled digital random noise generator. The digitally generated Gaussian sound is passed through a spectrum shaper to flatten its response through the midrange, corresponding to human speech frequencies. 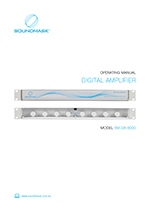 The digital amplifier is capable of driving 50 Soundmask transducers. The SM-DX-4800 features 4 channel input and 8 channel output, selectable 6 bands of parametric EQ per channel, multiple crossover selections and full function limiters. The unit also features remote computer control through a LAN connection. Where powerful soundmasking service is required, for example in highrise buildings , Soundmask’s SM-DX-4800 paired with the Digital Amplifier (SM-DA-8000) can couple with just one generator to power up to 800 transducers with 8 independent zones. Soundmask’s SM-DR-5000 can be used where separate areas have different needs, but the client wants to spare the expense of multiple generators. 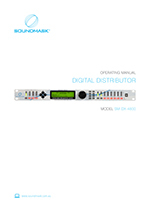 The unit is a five channel volume control, each channel with separate attenuator. 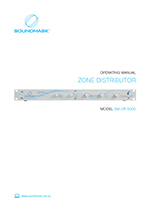 It is a single rack unit designed for convenient installation. Each channel has a maximum loading capability of 200 watts. Soundmask's SM-DA-8000 is an 8 channel digital amplifier, with an output of 50 watts RMS per channel @ 8 ohms. It features individual channel level control on the front panel, XLR inputs (received from the SM-DX-4800) for each channel and stereo banana jack outputs. 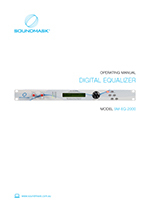 Being digital, this unit is extremely efficient and delivers uncoloured signal direct to the transducer.